We are seeing our government become out of touch and responsible for nothing. The elected officials give power to the bureaucracy, but don’t hold it responsible when it is ineffective or causes harm. Scott Johnson of PowerLine Blog reviewed a book on this - Is Administrative Law Unconstitutional? by Prof. Philip Hamburger in National Review in 2014. … The practice of rule by decree is of dubious constitutionality, to say the least, and Obama is extending it to the breaking point. While of dubious constitutionality, the practice is not without precedent. The precedent, however, is the prerogative power claimed in the past by the British king. It is the power against which the British revolted in the Glorious Revolution of 1688 and against which we revolted in 1776. Johnson briefly revisits it this week at PowerLine. Environmental Protection Agency (EPA) enforcers helped convict 185 Americans of environmental crimes this year, with each of these eco-convicts getting sentenced to eight months in prison on average for crimes ranging from biofuel fraud to illegally removing asbestos. EPA enforcement data for 2015 shows the agency opened 213 environmental cases which resulted in 185 people convicted and sentenced to 129 years in prison. EPA has been opening fewer cases in recent years to focus more on “high impact” cases. ...Every year, EPA agents help put dozens of Americans in prison for breaking U.S. environmental laws. Environmental crimes range from spilling coal ash into public waterways, to pretending to produce biofuels, to illegally cleaning up asbestos in buildings. Here are three global warming, that is, climate change, stories that were reported on in the UK, but not in the US, or hardly reported, according to my source. 1. NASA has "found the Earth has cooled in areas of heavy industrialization where more trees have been lost and more fossil fuel burning takes place." This is, of course, the opposite of what we've been told for decades. 2. Polar bears are increasing. 3. 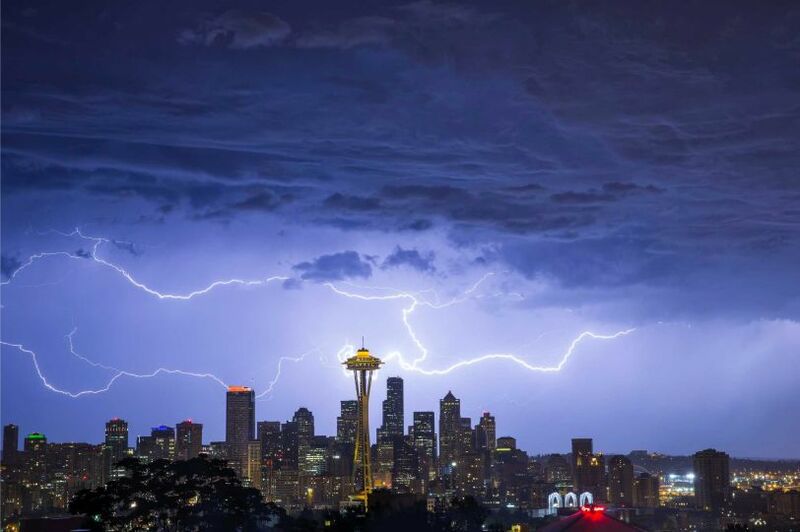 Scientists are collecting bad weather data from compromised sites. This one is not new, but seldom reported. 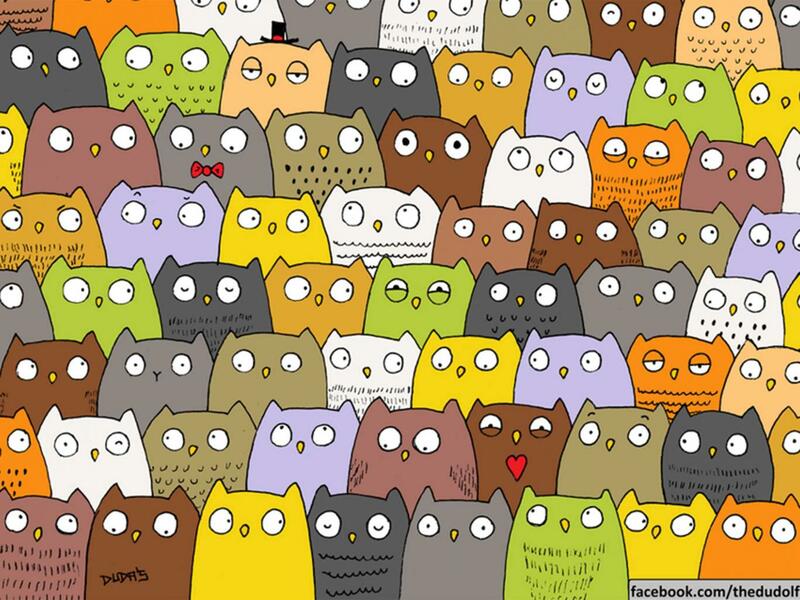 Graphic: Find the cat by Hungarian artist Gergely Dudas. Cases of other diseases rife in the Victorian era including scurvy, scarlet fever, cholera and whooping cough have also increased since 2010, though other diseases are decreasing. What is happening? The Fabian Society blames the government. Eric Worrall at WattsUpWithThat looks further and finds large increases in energy costs. Those costs, of course, hit the lower-income people much harder. … The article in the Independent carefully avoids mentioning the cost of energy, but you don’t have to look far for evidence that electricity prices are placing a lot of stress on British household budgets. Quite apart from devastating job losses which occur when energy intensive industries are forced to close, because they can’t compete with lower energy costs in other countries, Eurostat reports that electricity costs have surged from £0.121 / kWh in 2010, to £0.155 / kWh in 2015 (USD $0.23 / kWh), a rise of 28%. A lot of British homes rely on gas for heating, this isn’t always the case, especially in isolated rural regions. In any case, the price of gas has also surged, from £0.035 / kWh, to £0.046 / kWh. Thanks to British hostility to fracking, British gas supplies and prices are vulnerable, to political instability in Russia, and to sudden cold snaps – Britain is on the end of a long supply chain of countries which quite reasonably place the needs of their citizens first. British people are slowly waking up to the cost of green energy. For the British middle class energy costs are a serious annoyance. For the poor, rising energy prices are an unmitigated disaster. Adding to this burden, in the name of saving the environment, must be contributing to the ongoing surge in poverty related illnesses. South America’s socialist leaders are running out of money. And corruption is catching up with several leaders. Argentina is a mess; defaulted on sovereign debt again last year. Venezuela despite having among the largest oil reserves in the world, has gone hugely into debt and destroyed its own economy. It memorably could not afford to import toilet paper; and blamed unknown capitalists. And the government calls out the national guard if the long lines at stores get unruly. But… In Argentina a non-Peronist was recently elected president. In Venezuela the opposition won control of the national assembly. But Chavist President Maduro says the revolution will continue. “Throughout history, poverty is the normal condition of man. Advances which permit this norm to be exceeded — here and there, now and then — are the work of an extremely small minority, frequently despised, often condemned, and almost always opposed by all right-thinking people. Whenever this tiny minority is kept from creating, or (as sometimes happens) is driven out of a society, the people then slip back into abject poverty. 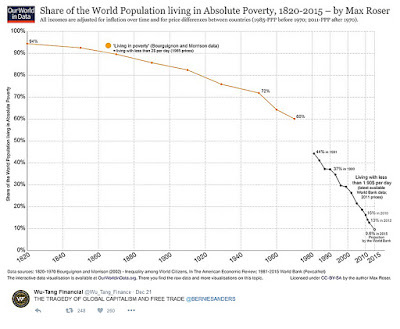 Around the world deep poverty is dropping and dropping and is now below 10%. This is huge: until 1860 it was over 90%! Everyone! This is very good news. The term means per person income of less than $1.90 per day, indexed for inflation and adjusted for different countrys’ cost levels. 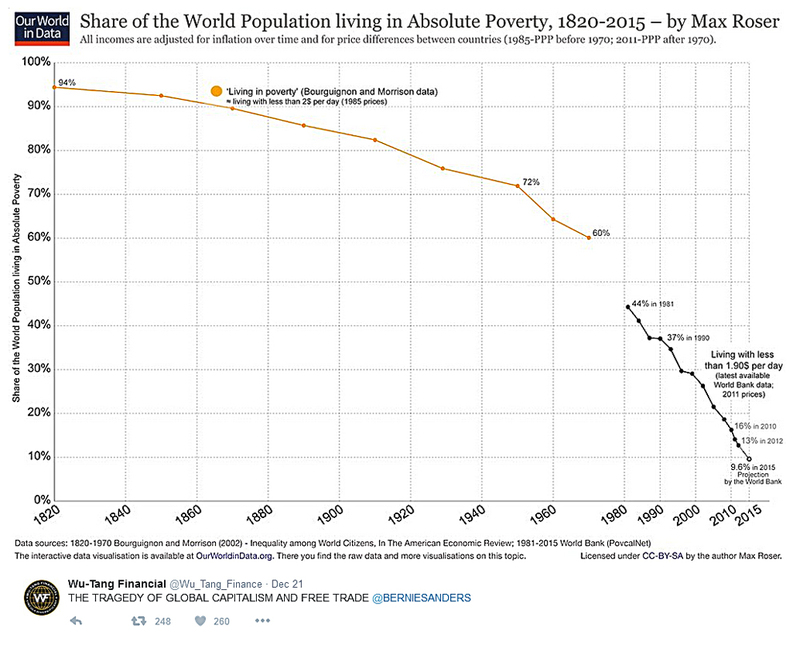 … For most of human history, of course, extreme poverty was the norm. People worked hard to get — if they were lucky — three meals a day and clothes on their backs. Money was scarce, possessions were few, leisure existed only when all the work was done, which was seldom, and capital for investment was scarce — as were things to invest in. Deaths from sickness and violence were common: As Steven Pinker has noted, human beings back in the era before nation states developed had a 15% chance of dying by violence; numbers today are vastly lower. This is true, he notes, despite the number of deaths from wars and civil wars. The best to all veterans today. Even though I was in Army National Guard and Army ROTC, I never considered myself a veteran, because I neither served long-term nor overseas. But I was active for five months and wore green uniforms for 3 1/2 years, including on the U of Washington campus during the Vietnam war. Doesn't that count? President Obama today says that at VA medical facilities the waiting lists are much shorter. Where did he get his data? The whole VA scandal was about VA officials building false waiting lists and throuwing those who waited long off the list to make the data look better. Who is Obama believing? In Phoenix, where deaths of those waiting broke open the mess, veterans are protesting today. They say that Skye McDougall, who was appointed in October to serve as the new director of the Southwest Health Care Network, lied to Congress on wait times in So. California. Putting her in charge won't help any. USA Today tells more about the unacceptable situation. Donald Trump would kill NAFTA, North American Free-Trade Agreement in order to save US jobs. But doing so would make things worse, not better. Our exports are up since NAFTA. Our economies are integrated - Manufacturers allocate different tasks to firms in the US, Canada and/or Mexico, using the comparative strengths of each. Cars being manufactured cross between the US and Canada, sometimes more than once! Putting up Donald Trump's wall would break those relationships that have been developed and refined over decades. That would raise costs to the producers - and to us consumers. If your city/town is dying then move! If your city/town is failing then MOVE. It’s the best thing you can do. If you stay to live among the ruins you and your sons and daughters will have fewer and fewer opportunities. The town where my parents grew up and where my grandparents lived no longer exists. Phillips, Texas, is a ghost town. Before that it was a company town, a more or less wholly owned subsidiary of the Phillips Petroleum Company. Phillips had already lost a great deal of its population as highway improvements sent residents off to the relative urban sophistication of Borger, and there were fewer than 2,000 people living there in 1980 when an explosion at the refinery destroyed practically all of the town’s economic infrastructure, along with a fair number of houses. Phillips, Inc., in the end decided it had no need for Phillips, Texas, and the town was scrubbed right off the map. The local homeowners owned their houses but not the land they sat on, which belonged to the company. (These sorts of arrangements were, and are, more common than you’d think, as in the case of the many Californians in the Coachella Valley who own their houses but lease their land from the Agua Caliente band of Cahuilla Indians.) Many of the residents of Phillips were uneager to be evicted from their homes, and they sued the company with the help of the famously theatrical Texas trial lawyer Racehorse Haynes, who informed the good people of Phillips: “They might whup us fair and square, but they better bring lunch.” Lunch was served, and Phillips is just gone. It was the right thing to do. Some towns are better off dead. Recycling is a waste. Expect for only paper, cardboard, steel and aluminum for greenhouse gas emission reduction. The very respected science reporter John Tierney for the establishment NY Times says so after full research. ... In 1996, I wrote a long article for The New York Times Magazine arguing that the recycling process as we carried it out was wasteful. I presented plenty of evidence that recycling was costly and ineffectual, but its defenders said that it was unfair to rush to judgment. Noting that the modern recycling movement had really just begun just a few years earlier, they predicted it would flourish as the industry matured and the public learned how to recycle properly. So, what’s happened since then? While it’s true that the recycling message has reached more people than ever, when it comes to the bottom line, both economically and environmentally, not much has changed at all. Blogger stopped accepting posts from both my blogging applications a couple months ago. Haven't figured out why. I am going to attrmpt more posts via Bloggers adequate, but less friendly web interface. I see news and analysis crying out to be emphasized on my very popular Economic Freedom blog. Jimmy Carter rushed to get his photo with dictators while worlds leaders were in NYC for United Nations meetings. See his big smile with Nicolas Maduro the “elected” dictator who has made Venezuela and absolute mess - very high inflation, shortages of basics including toilet paper and armed soldiers at grocery stores to control the lines of frantic shoppers. Here is a post on lack of rule of law and good currency, comparing Venezuela to Ecuador. A Houston County jury found Olivia Reynolds guilty Wednesday afternoon for her role in a voter fraud case. Assistant District Attorney Banks Smith said the jury found 66-year-old Olivia Reynolds guilty of 24 felony counts of absentee ballot fraud. Smith said the jury deliberated for less than an hour before returning with the guilty verdicts. Houston County Sheriff’s investigators arrested Reynolds in May 2014. She was one of three women charged who worked on the 2013 campaign for District 2 City Commissioner Amos Newsome. In the August election, Newsome beat challenger Lamesa Danzey by 14 votes. Newsome received 119 of the 124 absentee votes that were cast. Danzey received more votes than Newsome at the polls. Reynolds is the third suspect in the election fraud investigation to go to trial. Smith argued to jurors during his closing Wednesday morning that investigators with the Houston County Sheriff’s Office found evidence of widespread voter fraud during the District 2 race for the City of Dothan election in the summer of 2013. Smith said some of the voters testified at trial how they never wanted to vote for Newsome yet their ballot was cast for Newsome anyway. “This case is about the sanctity of the ballot,” Smith said. Via Thomas Lifson at American Thinker. Unbelievable. An Islamist attacked personnel in a recruiting center in Chattanooga, TN a couple of weeks ago and killed four active duty Marines and on Navy reservist. The facility commander returned fire with his personal weapon - Navy Lt. Cmdr Timothy White. He is a hero. But not to Obama’s military. The Navy is bringing criminal charges against him who defended his comrades. Navy Lt. Cmdr Timothy White will be charged with possessing and/or discharging a weapon on federal property. Unbelievable. Who is in charge of our military? But rather than being celebrated as a hero, Lt. Commander White may be charged for discharging a firearm on federal property. Ladies and gents, resulting from the text message I received yesterday, I can confirm that the United States Navy is bringing charges against Lt. Cmdr Timothy White for illegally discharging a firearm on federal property. The text message asked if it would be possible for Lt.Cmdr White to reach out to me. To wit I replied, affirmative. What kind of freaking idiots are in charge of our Armed Forces — pardon me, our “unArmed Forces”? 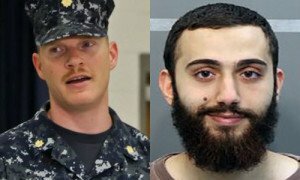 What would they prefer that Abdulazeez had been able to kill all the Marines and Sailors at the Naval Support Reserve Center? Let me draw an interesting contrast: Secretary of the Navy Ray Mabus is more concerned about lifting the ban on transgendered Sailors. Mabus has a problem in that for the first time since 2007 the US Navy will not have a Carrier Battle Group operating in the Persian Gulf. But this knucklehead has no problem with the Navy seeking to destroy the career of a Sailor, a commander of an installation, returning fire against an Islamic jihadist attack. I do not care if it was his personal weapon, he deserves a medal for facing the enemy. We are hearing this and that about President Obama’s historic agreement with Iran then ends sanctions and allows Iran to return to polite society. But don’t take my word for it. Read it yourself at Vox. I quote the intro below, but read the whole thing; it’s not very long. International negotiators assembled in Austria have announced the final terms of the Iranian nuclear deal. The purpose of the deal is to limit Iran's nuclear program to something that is small, safe, and peaceful — and to impose lots of invasive inspections to make sure Iran is keeping to its end of the deal. In exchange, Iran gets relief from some of the economic sanctions that have crippled its economy. Both sides, the thinking goes, also get to avert a war. Moving low-income people did not improve their lives. Repeat it??? Obama has a new initiative to move racial-minority people to the suburbs to improve their living conditions, incomes and school results. But this was tried by Pres. Clinton, called MTO, “Move to Opportunity," and it didn’t work. People did not go off welfare; indeed, use of food stamps went up. School results did not improve. And crime followed them to the suburbs! We know because the results I am citing were carefully collected by the Dept of HUD over fifteen years in a 187-page 2011 report. Social Engineering: President Obama's new suburban integration plan won't just harm the middle class by reducing safety and property values. It won't even provide the economic benefits it promises to relocated minorities. We know this because HUD already tried a similar experiment under President Clinton of resettling urban poor in the suburbs. It failed, as a HUD study reveals. From 1994 to 2008, HUD moved thousands of mostly African-American families from government projects to higher-quality homes in safer and less racially segregated neighborhoods. The 15-year experiment, dubbed "Moving to Opportunity Initiative," or MTO, was based on the well-intentioned notion that relocating inner-city minorities to better neighborhoods would boost their employment and education prospects. But adults for the most part did not get better jobs or get off welfare. In fact, more went on food stamps. And their children did not do better in their new schools. The 287-page study sponsored by HUD found that adults who relocated outside the inner city using Section 8 housing vouchers did not avail themselves of better job opportunities in their new neighborhoods, and saw a "sizable negative impact on annual earnings." "Moving to lower-poverty neighborhoods does not appear to improve education outcomes, employment or earnings," the study concluded.Even then-senior HUD official Raphael Bostic, a black Obama appointee, admitted in a foreword to the 2011 study that families enrolled in the program had "no better educational, employment and income outcomes." Worse, crime simply followed them to their safer neighborhoods. "Males ... were arrested more often than those in the control group, primarily for property crimes," the study found. Voting fraud. Real vote fraud in Texas. In Rio Grande Valley campaign workers are paid to harvest votes. This is not get-out-the-vote. This is pay to vote for my candidate - the Democrat. A new FBI anti-corruption task force is trying to clean up the Rio Grande Valley of Texas. According to the Justice Department, in 2013, more public officials were convicted for corruption in South Texas than in any other region of the country. One of the practices the task force is looking at is vote-stealing. They're called politiqueras — a word unique to the border that means campaign worker. It's a time-honored tradition down in the land of grapefruit orchards and Border Patrol checkpoints. If a local candidate needs dependable votes, he or she goes to a politiquera. In recent years, losing candidates in local elections began to challenge vote harvesting by politiqueras in the Rio Grande Valley, and they shared their investigations with authorities. After the 2012 election cycle, the Justice Department and the Texas attorney general's office filed charges. "Yes, there is a concern in which the politiqueras are being paid to then go and essentially round up voters and have them vote a certain way," says James Sturgis, assistant U.S. attorney in McAllen. In the town of Donna, five politiqueras pleaded guilty to election fraud. Voters were bribed with cigarettes, beer or dime bags of cocaine. In neighboring Cameron County, nine politiqueras were charged with manipulating mail-in ballots. The pic. Texas A&M University beauties. Source forgotten. Today, July 4, we celebrate the birth of the United States of America. The Declaration of Independence was signed on July 2, 1776, but was not announced until July 4, 1776. So that is the day we celebrate. The Declaration says that King George III of Great Britain was violating the rights of his subjects in American; to the point that their differences were irreconcilable. So it was necessary to break the bond of the 13 colonies to Great Britain and to form a new nation. American leaders in the Continental Congress who signed risked everything - their lives, their land and homes, their possessions, their families and their own lives. 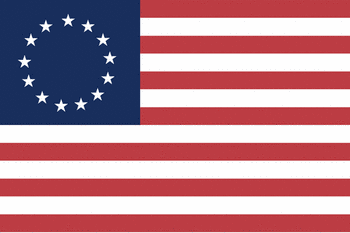 Images: the Betsy Ross 13-star flag is from PDClipArt.org. 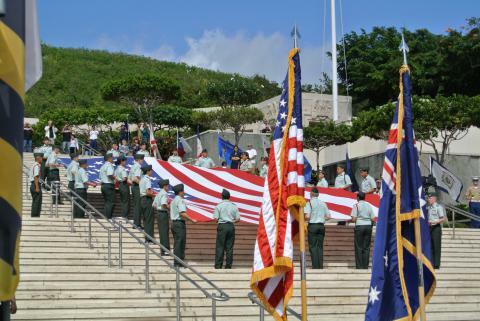 Below is Memorial Day at National Cemetary of the Pacific aka Punchbowl in Honolulu from American Battle Memorials. James Jamerson originated much of the bass guitar style we are all familiar with. He did it without credit in the studio band called the Funk Brothers for Motown records for 15 years in the 1960s to 70s. Before Jamerson the bass did “1-2-3-4”. He took a new approach and carried it to incredible heights. He died in his early 50s and got little recognition. But “Dr Licks” Allan Slutsky put together a film in 2002 on his life and music: Standing in the Shadows of Motown. Ed Driscoll tells about Jamerson at Blog Critics with interview of the book author and film producer “Dr Licks” Allan Slutsky. The movie at Amazon. The book came out in 1989 - Standing in the Shadows of Motown: The Life and Music of Legendary Bassist James Jamerson, at Amazon. Review: While at one time he was simply known as "The Motown Bassist" to thousands of aspiring bass players around the world, including more famous and world class bass players than you can imagine, James Jamerson is now a legend of immense proportions. If you don't know who Jamerson is by now then you simply must get this book. If you do know who James Jamerson is, then this book is a no brainer. Quite possibly the most influential musician of the past 50 years. If it weren't for him, the Beatles, Led Zeppelin, and countless of others in the rock and r&b genres wouldn't sound the way they do. The biography is compelling and I read it straight through over a several hour period when I first received this book. The lessons are difficult, and definately not for the beginner. For a beginner who wants to learn classic R&B style bass playing I'd reccomend the Duck Dunn book (What Duck Done) ... When you get through that book you can go on to Funkmasters and learn some classic James Brown grooves. Finally, when you've graduated from those books you can take a crack at the Jamerson book, though I think it should be on your shelf from day 1 to give you inspiration, and so you can listen to the tracks with the bass prominently mixed. Just to get it into your ears, so to speak. You might also hear a Motown tune you think you can pick up and will want to reference this book. Today, June 14, we honor the flag of the United States of America. The flag was comissioned in 1777. One hundred years later the first Flag Day was held. National Constitution Center at Yahoo News tells about Flag Day, authored by Betsy Ross House. President Obama is divorced from reality. 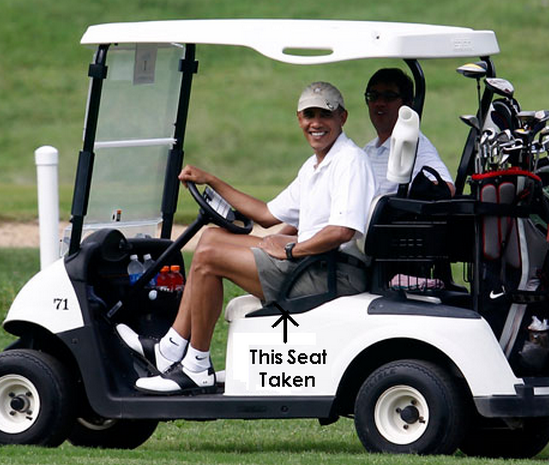 Monday June 8 he was boasting about the success of his ObamaCare. ● “The overwhelming majority of people are satisfied” with the new law. But he is not telling the truth. Costs are up and it is unpopular in polls. Oh really. The costs to Americans for health insurance in the new ObamaCare era are soaring across the country. The latest numbers for premium increases show the following dismal news for families. In California, approved rate increases going into effect this year are running up an average of about 10%, or five times the rate of inflation (which actually turned negative in the most recent 12 months - BLS). In Florida, 33 of 36 approved rate hikes were greater than 10%. Next year might be even worse. In Ohio, the average rate increase request for 2016 is 17.8% as of June 9, 2015. In Virginia, the AETNA Life Insurance Company small group plan proposed an increase of 59.71%. In Texas, more than half of the rate hike request are greater than 20%. In Illinois, the popular Blue Cross Blue Shield Preferred Individual plan wants a 38% rate hike. Numerous other plans costs will rise by 50%. Real Clear Politics has reviewed the major polling results on ObamaCare over the last two months. It finds that the average result is that 43% of Americans support the law and 53% oppose it. A May Gallup poll found more than twice as many respondents (24%) say the law has hurt their families than say it has helped them (10%). Most say it has made no difference. This sounds a lot more like dissatisfaction with the new law. ... As regards the Israel Palestine conflict I have always supported a two-state solution despite my extreme opposition to Islamic violence and sharia law. I have questioned the lack of elections in the Palestinian Authority for over 6 years now. Yet, while my positions and the way in which I live my life are aligned with liberal principles recently I ran from their unwavering dogma as regards the breaking Israel news of the Western capitulation and acquiescence to Iran’s pursuit of nuclear energy, enriched uranium, and weaponized missile technology. This threat is real and palpable. Prime Minister Netanyahu, who has never been my candidate of choice for the role, has continued to speak out against the deal as not only a dangerous threat to Israel, but to the world. On security, I trust the man. He has access to information I cannot begin to imagine. One thing we have learned in the most egregious and gruesome of ways: when someone says they want to kill the Jews -- believe him or her. They mean it. He finds that higher pay will allow minimum-wage workers do afford better places to live. It’s a win-win situation. Heaven on earth. Wrong! Wrong because he either willfully or ignorantly ignores what happens when more people are willing and able to pay more for rent. The increased demand with the same supply will cause rents to go up. 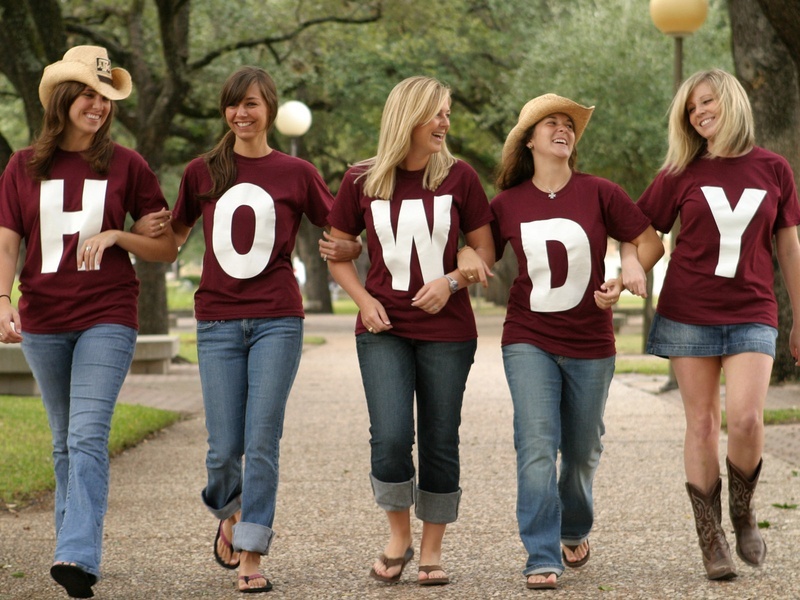 It’s the law of supply and demand = Econ 101. Doesn’t Balk know the very basic law of supply and demand? So a few months from now Balk and every City Council member will angrily investigate why greedy property owners have raised their rents. The answer is staring him in the face. Supply and demand is called a law because it always works. Baghdad Jim McDermott suddenly realized that Obamacare (he was a big cheerleader for it) raised the cost of medical care. Obama named it Patient Protection and Affordable Care Act. But naming it affordable didn’t make it so. Duh! Last week, IBD reported that BlueCross BlueShield of Tennessee wants to jack up its ObamaCare premiums by more than 36%; CareFirst in Maryland by close to 30%; and Moda Health in Oregon by almost 50%.Since then, North Dakota has reported rate hike requests of 43%, Kansas 38% and Iowa 18%. Even the ObamaCare-loving Huffington Post is admitting that one reason for the hikes could be that "healthy people aren't lining up for coverage in the numbers that either the industry or outside analysts had hoped." None of this is good news for all those ObamaCare "death spiral" deniers, who said that the law would never produce such results. But rather than face this reality, Democrats have decided to decry the alleged problem of the "underinsured," and call for more cost-spiraling mandates. Rep. Jim McDermott, D-Wash., for example, complains that "we've got some 17 million more people covered" with ObamaCare, "but they can't access the care they seem to be entitled to." What could have gone wrong? Could it be Nancy Pelosi’s and Honorable Harry Reid's design? First, ObamaCare imposes a pile of costly rules and regulations on the insurance industry — mandating generous coverage, outlawing risk rating, and so on. Then, to cope with these costs, insurance companies employ large deductibles and co-pays to keep premiums within the realm of reasonable. Now, the same Democrats who created this problem want to force insurers to lower deductibles and co-pays so health care will be more "affordable." Never mind that this would, if enacted, produce yet another round of [mandates which would, as always result in] massive premium hikes. Hey, Rep. Jim! There is no such thing as a free lunch. Not even when you pass a law saying there is. The rule of law subjects the State to a fixed set of rules that limits the scope of its coercive powers. Individuals and their property are protected from the arbitrary, ad hoc actions of the State and other individu- als. In consequence, individuals can plan their activities within the confines of known, fixed “rules of the game.” This allows people to pursue their personal ends, as long as their actions do not infringe on the broadly-defined property rights of their fellow citizens. Then the mess of Venezuela. Today, Venezuela has at best a tenuous grip on the rule of law. This is nowhere more visible than in the monetary sphere. The country’s foreign exchange reserves are falling like a stone (see the accompanying chart). Meanwhile, in Ecuador most people suffered decades of impoverishment for the benefit of the elite. There were even laws to benefit the rich. Ecuador represented a prime example of a country that was incapable of imposing the rule of law and safeguarding the value of its currency, the sucre. The Banco Central del Ecuador was established in 1927, with a sucre-U.S. dollar exchange rate of 5. Until the 1980s, the central bank periodically devalued the sucre against the dollar, violating the rule of law. In 1982, the central bank began to exercise its devaluation option with abandon. From 1982 until 2000, the sucre was devalued against the dollar each year. The sucre traded at 6,825 per dollar at the end of 1998, and by the end of 1999 the sucre-dollar rate was 20,243. During the first week of January 2000, the sucre rate soared to 28,000 per dollar. In the case of Ecuador, the inability of the government to abide by the rule of law was, in part, a consequence of traditions and moral beliefs. Ecuadorian politics have traditionally been dominated by elites (interest groups) that are uninhibited in their predatory and parochial demands on the State. With the lack of virtually any moral inhibitions, special interest legislation was the order of the day. For example, during the rout of the sucre in 1999, laws were passed that allowed bankers to make loans to themselves. Then Ecuador implemented a policy of sound money and stuck with it. They got rid of their own currency and adopted the US dollar in 2000 and gained stability. … the critics of dollarization condemned it as something akin to voodoo economics. Well, the critics have been predictably proven wrong. The misery index is an objective measure of just how well dollarization has worked. The index is equal to the sum of the inflation rate (end of year), bank’s lending interest rates and the unemployment rate, minus the actual percentage change in GDP per capita. Simply put, a high index means higher misery. In Ecuador, prior to the implementation of dollarization in 2000, the country sustained a misery index of over 120. The public suffered greatly from inflation, but after dollarization was implemented, high inflation was stifled and misery drastically fell. The accom- panying chart shows the direct link between dollarization and the immedi- ate and sustained decrease in misery. From 2003 through 2014, the misery index in Ecuador has been remarkably constant at around 20 – one of the lowest in Latin America. Ecuadorians know that dollarization has allowed them to import a vital element of the rule of law – one that protects them from the grabbing hand of the State. That’s why recent polling results show that dollarization is embraced by 85% of the population. It’s time for Venezuelans, as well as many others, to take note and dollarize. On Memorial Day we remember those who gave their lives to preserve our liberty. Hawaii for Visitors has a page on war memorials in Hawaii; they all are on Oahu. One of my favorite places in the world is National Memorial Cemetary of the Pacific in the center of Honolulu, Hawaii. It is known as The Punchbowl for its unique shape: it is a volcano crater of just the right size. The photos: Aerial view by Hawaii Visitors. The central structure of the cemetary: on the sides are the names of men and a few women who died in the Pacific whose remains were never found. Along its top are a series of panels that tell the story of the Pacific War with maps done as beautiful mosaics. Photos from a defunct site called The World Tourist. Prof. Paul Krugman - did you know he got the Nobel Prize? - goes to extremes to present his arguments for more, more government control. This week he pulled a trick he would not allow a sophomore to do. The data on housing starts vs. interest rates only supported his thesis for a range of years, but not for the other years the data are available. So he took out his scissors and very carefully cut off the first years - about 1958 to 1965 - and the last - from 2000 to 2014. Then he shouts “The data prove it! Look!" See Thomas Lifson at American Thinker for the full explanation. Graph: The full data set from FRED. Mike Banner, my long-time coworker is featured in the Seattle Times this weekend, because last year he accomplished ascending Mt. Rainier fifty years in a row. 50! You would think he would be single-minded to get to the top. No. He invites rookie climbers, non-climbers, on his ascents. He takes them up - often to Camp Muir at 10,000 feet on Rainier - for a mini-course in glacier climbing. Of course having inexperienced people on the climb lowers the chances of success. Extra care must be taken on the glaciers in the presence of crevasses, they have less awareness of what they can and cannot do and therefore expend more energy than those experienced. Furthermore weather often slows or cancels a climb. Of course he does not take them on the more difficult routes, like Liberty Ridge or Kautz icefall. I wish I had good photos of that climb, because that year there was an unusual condition in the ice called nieves penitente, that usually happens much closer to the equator in the Andes. Nieves penitente (means praying snow) is little towers of ice - an expanse of them - in our case, one to three feet high. It’s unreal to realize you are walking among miniature ice towers! See Wikipedia. Mike has introduced many people to the mountains. Congratulations to a gentleman. Sen. Hatch blocks disclosing text of TPP before it is voted on Even Hatch doesn’t know what’s in it. Duh. I have a revolutionary idea: Congress should see every word of every bill and whatever else they vote on. The text should be - must be - disclosed and they should READ every word. To not know what they are passing is irresponsible. I am looking forward to Honorable Mr. Hatch explaining why it is reasonable, even conceivable, for him to vote on secret text. The Washington Education Association is demanding more money in the state budget - and going on strike for it - every day in a different school district. But they never say how much. How much is enough? $1.3 billion is real money to me. How much are they asking for? Second, these strikes are illegal. Is the WEA telling teachers they are being asked to break well established state law? Not the few I talked to. See Sound Politics. Third, consequences: Why can teachers walk off the job and not lose one penny of pay? They have no consequences for breaking the law. But you and I are not so blessed. If I did a taxpayer strike and didn’t pay my property taxes the county would seize our house, sell it and give us a pittance. A strike by me would have huge consequences. (If I only went out for one day the cost would be less than $100; not a lot, you may say, but it's cash out of my pocket. In 2015 when I pay my property taxes on our suburban split-level I am paying over $2,000 to the local school district. $2,000 is real money to me. How much do they expect me to pay? Day by day the teachers in a school district are walking off the job on strike. For only one day, but on strike nevertheless. But strikes by public employees are illegal. Strikes are illegal, but there are no consequences. If I went on strike I would have lost a day’s pay for each day, but the teachers - they don't. The law which authorizes collective bargaining for teachers specifically provides that, "Nothing contained in this chapter shall permit or grant any public employee the right to strike or refuse to perform his or her official duties" (RCW 41.56.120). The website for the State Office of Financial Management bluntly notes that state employees "are not permitted or granted the right to strike or refuse to perform their official duties." Furthermore, Washington Courts have a long history of declaring teacher strikes illegal and ordering educators to return to work, in some cases fining teachers who refused. 2011: Tacoma teachers strike. Pierce County Superior Court Judge Bryan Chuschcoff ordered teachers to return to work and threatened to fine them if they failed to comply. 2003: Marysville teachers strike. Snohomish County Superior Court Judge Linda Krese orders the strike to end, noting that "Public employee strikes are illegal under the common law of Washington. The [Marysville Education Association] strike violates the prohibition on public-employee strikes and is an illegal strike." 2002: Issaquah teachers strike. King County Superior Court Judge Joan Dubuque declares the strike illegal and threatens to fine teachers who continue to strike. Prior to 2002, state courts issued 24 injunctions against striking teachers. But President Obama has approved Shell’s oil exploration in the Arctic. He upheld a 2008 lease sale on Monday. Students are Western Washington University are upset that state Sen. Douglas Erickson is not chanting the AlGore global warming, no, climate change, chant. So they will use their skills in research and presentation to debate him. Right? No. They want to be radical. Radicals! So they are petitioning WWU to cancel Sen. Ericsson’s Masters in political science and environmental policy. “The Legislature finds that climate change is real and that human activity may contribute to climate change. F.A. Hayek, “The Use of Knowledge in Society"
- The river that runs through Isfahan now dried up. ...Two decades ago, Lake Urmia was still a popular destination for vacationers. Tourists marveled at the flocks of flamingos, pelicans and other bird life that gathered on its shores. Bathers immersed themselves in the saline waters and smeared their bodies with its legendary black mud, said to help heal stiff joints. Some called it Iran's version of the Dead Sea. "I remember how my late grandmother told us that nobody was in danger of drowning as you couldn't sink in the salty water," recalled Ameneh Saeedi, 33, a secretary in Tehran, who vacationed at the lake regularly with her family. "We used to stay up until the small hours laughing and swimming." Today vehicles can reach many of the lake's more than 100 small islands that were once a signature feature, havens for wildlife and humans on holiday. … Israel provides the sole exception to this regional tale of woe. It too, as recently as the 1990s, suffered water shortages; but now, thanks to a combination of conservation, recycling, innovative agricultural techniques, and high-tech desalination, the country is awash in H2O (Israel’s Water Authority: “We have all the water we need”). I find particularly striking that Israel can desalinate about 17 liters of water for one U.S. penny; and that it recycles about five times more water than does second-ranked Spain. Liberation Theology was born in Khrushchev's KGB. The Soviet leader intended to infiltrate Central and South America. His way to do so was to recruit church leaders to his Communist ideology by cloaking it in a class warfare that appealed to them. His effort was successful until Karol Wojtyla was elevated to Pope John Paul II in 1978. He selected Bishops who would oppose Communism. By the way, a Peruvian poet Gustavo Gutiérrez has always been credited with the inception of LT. But Pacepa says Gutiérrez’ book A Theology of Liberation: History, Politics, and Salvation reads like it was written in KGB headquarters at Lubyanka Square in Moscow. Actively Northwest shows links to fifteen sites showing activities. The list is family oriented, but not just for going with kids. Lots of ideas. Adventure Awaits - Washington State Parks posts an active idea - highlights a park - sometimes weekly, sometimes not. NW Trip Finder - Camping and non camping ideas from BC to Oregon. Small Towns - Lots on camping - Oregon Coast and Wine tasting. Hiking with My Brother - hiking. They do excellent maps. Greenstage July 10 to Aug 15. Most, but not all, are in Seattle parks. Wooden O of Seattle Shakespeare, July 9 to Aug 9. Seattle east to Issaquah and north to Lynnwood.